My big copper tray needs a liner beneath the sandwiches. My garden lettuce has bolted already. Instead of buying more leaf lettuce, I found a bundle of collard greens for 49-cents. 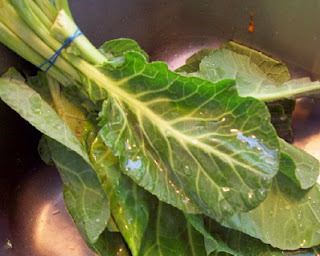 Thicker than lettuce and just as beautiful, collard greens cover more area without wilting. Wash well. A neighbor gave us surplus plum tomatoes. 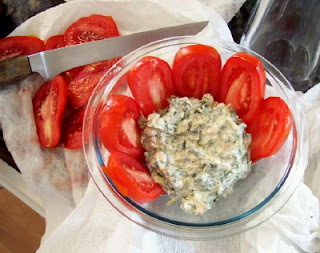 I sliced the middles to use on sandwiches, but I saved the ends to decorate the spinach dip. First, dab a little dip in the bowl to anchor the tomatoes. Then, mound the remaining mixture in the center.